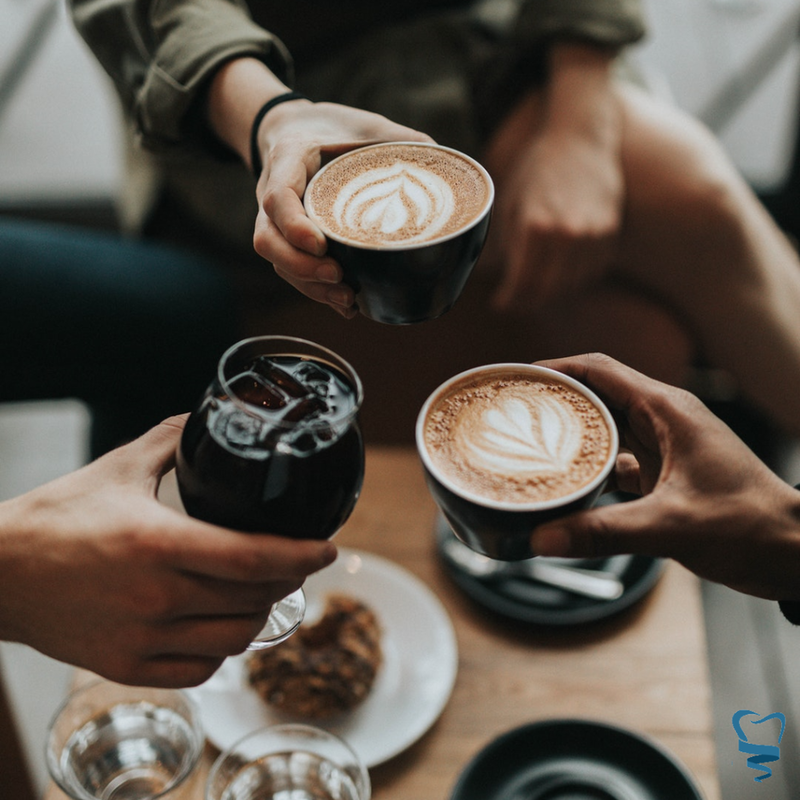 Good oral hygiene is essential for maintaining a bright smile, but if you want to keep your pearly whites the whitest they can be, you also need to pay attention to what you eat and drink. There are certain foods and beverages that can stain your teeth, making them appear discolored and dull. Here is a list of 5 common drinks that can stain your teeth and what you can do to combat their effects. Arguably the most popular caffeinated beverage as more than half of Americans consume at least one cup of coffee every day. It’s acidic and contains chromogens. Many people will switch from coffee to tea because of the misconception that tea won’t stain their teeth. The reality is that tea - iced or brewed, it does not matter - can actually stain your teeth more than coffee because of the tannins in them. Wine is highly acidic, contain tannins, and can be high in sugar. Red wines also contain chromogens. Sodas and energy drinks are very acidic and many contain chromogens. Even clear sodas aren’t immune from teeth staining properties. The citric acids in them make teeth more prone to staining. Some juices - i.e. grape, cranberry, and even orange juice - and sports drinks are acidic and contain sugar. The dark colors of some juices certainly don’t help your antistaining efforts either. Now you may be wondering what in the world chromogens and tannins are, right? Chromogens are a pigment producing substance that latches on to tooth enamel and stains teeth. Tannins are plant-based compounds that make it easy for stains to stick to tooth enamel. Although tannins won’t stain your teeth themselves, they make it easy for other foods and beverages, that you consume, to stain them. Acids and sugars erode tooth enamel, leading to decay and making it easy for stains to set into the teeth. Drink a glass of water after consuming a potentially teeth staining food or beverage. This will rinse your mouth and wash away leftover food particles. Don’t brush your teeth immediately afterwards. This may sound counterintuitive, but your tooth enamel has been weakened from acid and sugar so brushing right away may remove some of the enamel. Wait about 30 minutes then brush your teeth and tongue thoroughly. Lastly, you can chew a piece of sugar-free gum. Chewing gum stimulates saliva production which naturally rinses the mouth. Some of the drinks listed may have been obvious culprits to you and others may have come as a surprise. In a perfect world, we would all drink nothing but water and brush and floss our teeth after every meal. However, it’s not a perfect world and eating and drinking is in large part a social activity and a big part of our culture. Go ahead and indulge - in moderation of course - and follow our advice to keep your smile bright. And of course, you can always come in for a professional teeth whitening treatment to restore your teeth to their former glory! We offer the renowned Zoom whitening treatment in our office. We also sell a variety of professional strength whitening treatments that you can do at home. Contact us to schedule an appointment or for more information. We do our best to provide useful, informative content for our readers and welcome questions and comments. If you have something to add, let us know in the comments below!